When we first started looking for a dog, I didn’t think much about the pros and cons of adopting a rescue dog. Instead I became completely enamored with the idea of having a puppy. And looking back, I’m probably not the first person to head down that path. Puppies are adorable, but they do grow up, and puppies are also a lot of work, I learned. Lulu is the first dog I’ve ever had, so I knew very little about having a dog before we got Lulu. Growing up I had pet hamsters, and at one point, two goldfish. My husband, on the other hand, did have larger pets growing up. At one point he had a pet cat and later, a pet dog. He quickly said a puppy would not be a good option for us. I kept pressing the matter, not knowing why a puppy was a bad idea. Of course I kept looking at cute photos of puppies online during this time – both on breed websites and any puppies that were listed on rescue dog websites. As it turned out, he was right. An adult dog was better for us. Today I’m sharing how we made this decision and the experience we had with adopting an adult rescue dog. I also invite you to consider an adult rescue dog, even if you have a lifestyle that might be conducive to a puppy, you should consider the pros and cons of adopting a rescue dog. There are a few reasons why we decided a puppy was a bad idea for us. Let me preface this with saying at the time, we had a home, ample room for a dog and did not have any children. What we didn’t have was the time to devote to housetraining a puppy. Puppies have to be taken outside frequently to use the bathroom and they also need to be taken out in the middle of the night. They can’t wait to go for 8 or 12 hours like an adult dog can. This was a big factor in the pros and cons of adopting a rescue dog. We were both commuting to work, averaging 10 to 12 hour days, and could not come home from work during the day to tend to the puppy. A puppy could not be left alone for that long. If we were to adopt a puppy we would need to invest in a dog walker or someone to talk the dog out during the day for bathroom breaks. While this was a large deciding factor in why we adopted an adult dog, I do want to mention that we did have to do some potty training refresher with our dog Lulu. We later learned PoochieBells are a wonderful house training tool for any dog! I was initially crushed that we weren’t going to get a puppy. 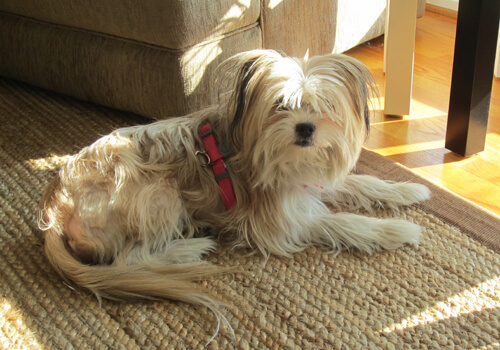 But, today I realize our Lhasa Apso mix Lulu was meant to be with us and I couldn’t be happier. In addition, after learning about the needs at shelters for dogs to be adopted and the immense need to rehome adult dogs – I’ve become an advocate for adoption adult dogs. Here are a few things I learned during the first full year we had our rescue dog Lulu. Even though she was an adult dog when we adopted her (se was two years old according to the shelter paperwork), in many aspects our first year with her was like we had a puppy. This ended up being a welcomed surprise in the pros and cons of adopting a rescue dog. You are saving a life, cliche but so true. Less expensive. Lulu’s adoption fee was only $150. Your dog may be housetrained which saves you time and effort. Many rescue dogs are mixed breeds, meaning they are less prone to breed-specific health issues and may live longer. I want to be completely transparent so I’m also sharing some of the cons to adopting a rescue dog. Again, we are assuming the rescue dog is an adult dog and you are adopting from a dog shelter. It is difficult to find and adopt a puppy. Although, some shelters have them, ie. a rescue dog who recently had a litter. Your dog may not be house trained or may have forgotten the house rules. We used PoochieBells with great success to house train Lulu. I highly recommend them! Little or no medical history. We later found out Lulu has allergies, apparently to both beef and poultry. She now eats and loves Zignature dog food and we give her Zuke’s Mini Naturals Dog Treats. You may not find the exact breed you want. We had several breeds in mind when we were adopting to allow options. You may have to answer some personal questions, which can be uncomfortable and unexpected. Today, looking more at the pros and cons of adopting a rescue dog, we were able to teach Lulu house training again (it took a while but she was able to be left alone while we worked with no issues). I would also highly recommend investing in a good dog trainer, whether you have a puppy or rescue. We did research immediately and had Lulu walking without pulling on her leash within two months which helped with any previous behavioral habits she already had as an adult dog. I sometimes wonder what her “mix” is, and also wish I knew what her doggy parents and siblings looked like. But these wishes and hopes are not a deal-breaker. If given the chance, I think I would adopt again. Why not? If you are local to Cleveland, Ohio I can’t recommend the Cleveland APL enough. Their process was easy and non-intrusive. 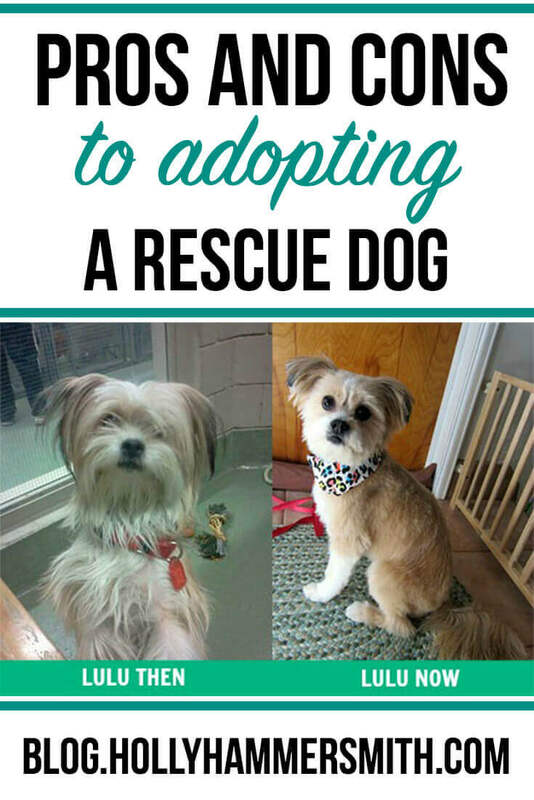 I hope you enjoyed learning the pros and cons of adoption a rescue dog and that this post was helpful. Where did your pet come from? What led to your decision? Hi Holly. Your story warmed my heart. Lulu is adorable. We don’t have dogs anymore but we adopted 2 black lab/border collie mix pups from our local humane society way back in 1999. They were a brother sister pair. They were wonderful dogs but like you said, raising puppies is not for the faint of heart. Luckily we were childless grad students and had time and energy to devote to our dogs. They lived long full lives but have both since passed on (a year apart), which was devastating to us. But we are considering adopting again — this time a young adult (although my husband thinks he wants a pup again). We have a busy family life now and also both work full time. Pet adoption via shelter, humane society, PAWS, or your local ASPCA is a gratifying experience regardless if you adopt a puppy or adult, and I highly recommend resisting the pure bread/breaded scene. Kathy, Thank you for your kind words. I hope you do find the perfect companion pet again. Yeah for adopting a shelter dog! I have to say though, all of the cons you listed could happen if you use a breeder, with the exception of not getting the breed you want… but really if you are patient, you can find just about any breed through a rescue. Many breeders ask personal questions about the prospective home their dogs will go to, some don’t care at all, but those are the kind of people no one should be encouraging to sell dogs. I adopted a 9 year old pure bred Border Collie with papers from a situation that the family lost their home. She was neglected her entire life, had sores on her, fleas, worms and no hair on her back half. She has been to the vet and is receiving treatment, but my point is that this is the first “pure bred” dog I have had and hands down has the most chronic medical issues. Lulu is so cute! I am glad she became part of your family. Thank you for sharing your story Chris. I hope the treatments work and your dog enjoys a healthy life with you! 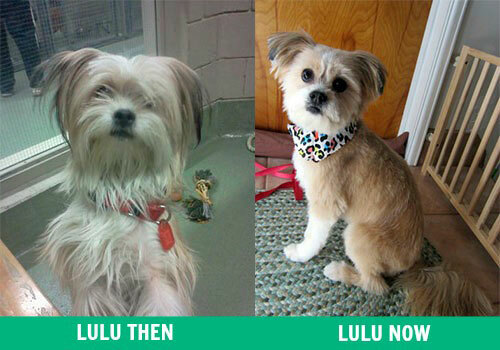 Aww … Lulu is so cute! I can’t have a dog in my current apartment, but I’m hoping that changes when we move in a few years. I’d love to adopt a rescue dog at that point! Great post. Adopting a rescue dog is always a good idea! I was planning to adopt from a rescue group when I ended up “adopting” from a friend who had taken my Hunter in after a friend couldn’t keep him. I didn’t know much about his history – I only later found out he came from a pet store- I just knew he felt like the right dog for me. I love him all the same, no matter what his origins were! I think the right dog has its way of finding you. Stopping by through SITS Sharefest. Great post about a subject most probably don’t consider. I bought my dog at a pet store 14 years ago because I knew her breeder was reputable. She’s an awesome dog and has added so much to my life. She was my friend when no one else wanted to be. In July 2013 we adopted our first dog. We weren’t looking for a puppy since we had just bought our first home…and found the most awesome dog. Completely house-trained. Knows several commands and listens really well. Leash trained. and is a 90-lbs. teddy-bear. In September we decided to try for a puppy and adopted the cutest dapple dachshund. Besides the normal puppy issues…he has been the best puppy. Ted & Jake are now part of our family and couldn’t imagine our home without them. I’d also like to add…dogs are way smarter than we realize and when you rescue a dog from a shelter and give them a home…they will re-pay the favor and love you forever. What a great story! Thank you for pointing out that rescues can and often do already have some training! Great point Steph. I know the agency we adopted from did a brief assessment to try and determine if the dog was friendly. That’s also why I highly recommend a reputable trainer who can help new pet parents work through any issues. Thanks for stopping by! I really see no downside to a caring human being rescuing a dog. If you want a certain breed, there are breed rescues that can help. Training and housebreaking is needed with any dog, so your advice to get a good trainer is excellent. AKC dogs are overbred, expensive, and it is heartbreaking that many good dogs are killed while people still choose to go the breeder route. Oh, and they do doggy DNA testing now, so if you really want to know her mix it is possible. Good point on breed-specific rescues Debbie. I have heard about the DNA testing but have also heard mixed reviews on how accurate it is. Might make a great post someday if we ever test Lulu. Wonderful post…great points! We currently have 7 pets (3 dogs, 4 cats)…6 of them were adopted from a shelter. Over the twenty + years my husband and I have been married, we have adopted 10 pets from shelters. Many were were older, although the 3 cats we have now were kittens when we adopted them. (The shelter had at the time just brought in a ton of cats and kittens from a single location. ) It’s a new lease on life for these animals who simply want some love and a family to call their own. They’ve given our family a lot of joy! Visiting from SITS Sharefest! Wow! What an awesome story. I love hearing about owners who have adopted from shelters time and time again. Love this! I really want my next dog to be a rescue. There’s just something so heartwarming about knowing you’re giving a dog, who will be unconditionally loyal and loving, a second chance at life and happiness. I too wanted a puppy severely, but I, like yourself, was talked out of this want by my husband who reminded me about house training, the whining at night, and the chewing of Ugg boots that come along with a puppy. So we adopted a dog from a rescue as well (a Brussels Griffon) and have been amazed at how lucky we were to find such a great well behaved and loving pet. Adopting is a great way to get a caring canine addition to your family. As a former dog rescue foster mom, I can vouch for most rescue dogs. Often times they do have hard habits, or haven’t been trained properly, but you can always teach an old dog new tricks! I always felt as though all rescues I came across were just so grateful for their home and family. Rescue dogs can be a bit of work, but so can puppies! Love your list! My husband and I adopted a rescue dog and our favorite “pro” about him is that his devotion to us is profound. We really think his previous owners must not have been very nice and that it makes him appreciate us that much more. He once got out the front door and when I realized he was out an hour later I discovered he hadn’t gone anywhere and had just calmly laid right down by the door prepared to wait. Stopping by from SITS! That’s amazing! I hope if Lulu ever gets out she doesn’t run from me but I’m afraid to know. Happy to hear your pet is so loyal! I really liked your insight because I am hoping to get a dog within the next 6-12 months. I am going back and forth with wanting a puppy or a rescue. Finding a rescue can be frustrating because I have been looking off and on for over a year and still haven’t found just the right dog for our family. I hope you find the perfect fit soon! We met several dogs and were “in line” to adopt and it didn’t work out because someone selected the pet before us. I bookmarked a lot of the adoption websites, set up email alerts, etc. and checked pretty aggressively. When we found Lulu we showed up the day after she was listed online. Great article! My husband and I decided to get a puppy from a breeder because we wanted to train the dog from the beginning to be a member of our family. I also wanted a very specific kind of dog, a toy poodle, because I grew up with one and had the best experience. Since I work full-time and my husband is in medical school, we invested in puppy kindergarten classes at a local training club. SO WORTH IT. They taught us how to connect with our puppy in a short amount of time. Poodles are also easy to house train, so the breed we picked helped the transition. This is a great idea for a post. I have two dogs that were from breeders and our most recent dog, Shorty, we rescued from the pound. Shorty initially cost us the most! She got very, very sick from something she had contacted at the pound, but we went through that and now she’s a very sweet, goofy member of our family! I’m glad Shorty is OK! Your Lulu is adorable. We adopted a rescue dog last year, and I am so glad. He has brought so much happiness into our home. Stopping by from Boost Your Blog. We have a rescued dog, too, and we love him! He’s had some “issues,” but overall he’s been great with our family. Another local homeschool family has a daughter whose passion is rescuing animals, and we got him from her when he was about 6 weeks old. If I had to do it again, I would probably still rescue a dog, but I would go through an official rescue organization with policies in place for when things don’t work out, and also one that might provide more support. However, I’m still glad we rescued our dog. We are crazy dog people and almost all our dogs have been rescues. The two latest additions are rescues, but were also 8 weeks old when they arrived at our house. It had been a long time since we had tried to housebreak a puppy let alone two. It has been an adventure. I’m stopping by from the 100 Day Challenge. I’m glad to have found your blog. Wow. Sounds like your hands will be full. Enjoy! I’m so glad you found Lulu! She’s so darn CUTE! Everyone is going crazy over people rescuing the Sochi dogs and bringing them back to the US. I sure wish those same people would adopt a local less famous dog! There are so many wonderful pets looking for their forever homes. I really encourage people to adopt the older animals, seniors need love too! We got Buffy when she was 10. Previously I adopted a 13 year old cat. It makes me happy to ensure their later years are their best.